In the Global Innovation Index ranking 141 economies across the world on innovation capacity and efficiency, India’s ranking has further slipped – 81 as compared to 76 in 2014. The ranking takes into account factors such as policy, decision-making, political environment and ease of doing business. While the findings may reflect public perception and the relative inactivity in the making of innovative policy decisions, one of the key transformative events is the Innovation for India Awards (IIA) 2016 by Marico Innovation Foundation. Now in its sixth edition, IIA 2016 recognizes the greatest innovations within the Indian business and social sectors. 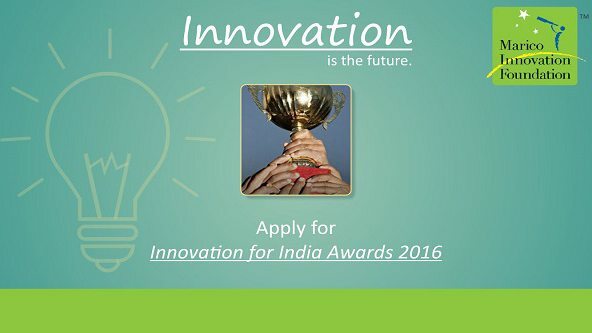 The winners of the Innovation for India Awards 2016 will have a chance to showcase their innovation in front of an audience comprising of entrepreneurs, innovators, heads of various private equity and seed funds and academia associated with the innovation ecosystem in India, with the final ceremony scheduled for March 2016. The Awards, nearing the end of the application sourcing process, comes at the time when India and the United States of America have agreed to launch a forum next year to boost innovation and related two-way investment and trade. This forum will be private sector-led and aims to scale innovation by supporting the advancement of small and medium-sized enterprises (SMEs) and promoting skill development. The current Make in India campaign has projected the country as a destination for innovation and particularly manufacturing. However the large portion of the current workforce in India may be unskilled for such a large wave of manufacturing. This is where India’s culture of jugaad, frugality, recycling and sustainability comes into play. This ability within India innovate within such constraints deserved to be showcases. IIA 2016 will feature innovations across spectrums – be it resource-laden or resource-scarce. Any company, organisation or government body, which has been successful in introducing an innovation, will receive formal recognition by Marico Innovation Foundation as part of IIA 2016. The Awards will also help create awareness about breakthrough innovations that have been successfully implemented to inspire others and provide a forum for networking and learning.